AppBoard Tuesday - It’s Time To Go Green! We make apps for the latest smartphones and tablets. Yes, the very same gadgets which collectively spit out almost 7 megatons of toxic greenhouse gases worldwide, while being charged. If you feel that’s a pretty serious figure, try this one on for size – the carbon emission volume caused by phone charging is likely to touch 14 megatons by the end of 2019. It’s high time each one of us started doing our bit to raise environmental awareness and preserve nature. In this comeback edition of AppBoard Tuesday (you noticed that ABT was away for four weeks, right? ), we will look back on our first attempt at giving something back to Mother Nature. We had a general idea that planting saplings in an open space would be the way to go – but the finer details had to be sorted out. Two Fridays back, we picked this as the main topic under discussion during our regular brainstorming session. After each of our in-house mobile app developers, testers, graphic designers and other staff had suggested a name for the campaign – we deliberated on the suitability of each of them. Finally, the name ‘Go Green, Help Clean’ was chosen. It was simple, had a nice ring to it, and most importantly, it focused solely on the importance of…well…going green. Nothing about computers and apps and what-not. It wasn’t just another ho-hum CSR activity, you know? We cared! 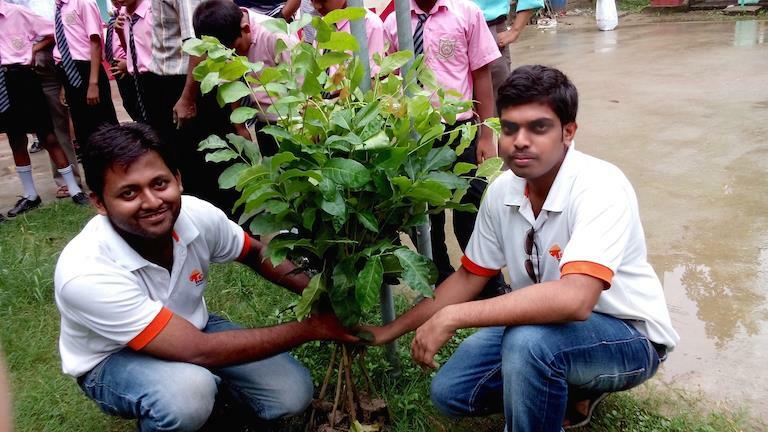 Next arose the question of location – where should we plant the saplings? Finding a non-congested area in or around Kolkata is not the easiest thing in the world – and a couple of days passed, before we could come up with a few alternatives. 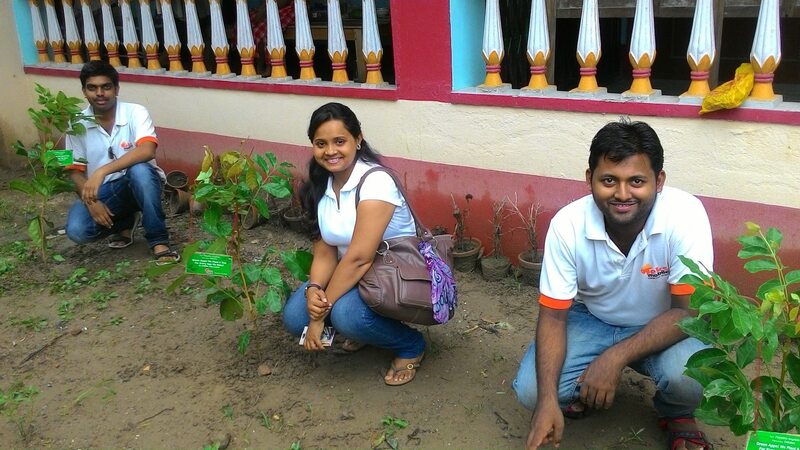 Finally, the campus grounds of Bodhisukha School (Barasat) was chosen as the ideal place to kickstart our campaign. A big thumbs-up to the school authorities here – they agreed immediately to our proposal, and promised all possible types of help in our tree-planting endeavors. You see…we are a team of iPhone app developers and graphic experts and master coders – but when it came to matters of the soil, we did need a bit of assistance! The only question that remained to be addressed now was deciding on the number of saplings we would plant in the first round of the ‘Go Green, Help Clean’ drive. We wanted to have a rationale behind the number we chose (something like ‘500+ plants’ sounded all too gimmicky). Finally, it was decided that a separate sapling would be planted for each mobile application in our app development portfolio. 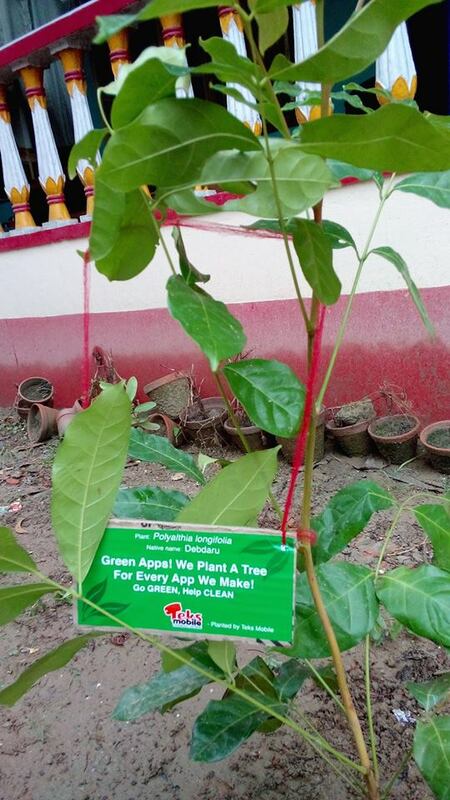 This ensured two things: a) we would be planting A LOT of saplings (given that our total app count is inching towards 950), and b) it would be a continuous process – a new app goes live, a fresh sapling gets planted. That’s just the way we had envisaged the campaign from the very outset. With plans in place and saplings in hands, it was now time to make the journey to Bodhisukha school. The rains stayed away (thankfully! ), and we reached the school premises early enough. It was a pleasant surprise to find the students all ready and looking forward to the tree-planting campaign. Their eagerness reinforced our belief that we were on to something good, something that will matter in the long-run. It was time to get our hands dirty next. 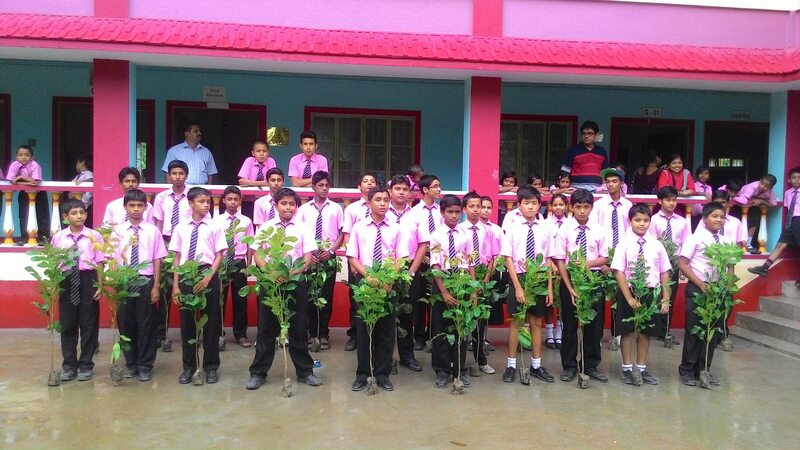 Our mobile software developers and app-makers worked hand-in-hand with the delightfully enthusiastic pupils of Bodhisukha – and within a matter of a couple of hours, a fairly large number of saplings had already been planted. A bit of rest was in order (this wasn’t the usual ‘working-in-an-AC-office’ day, after all! 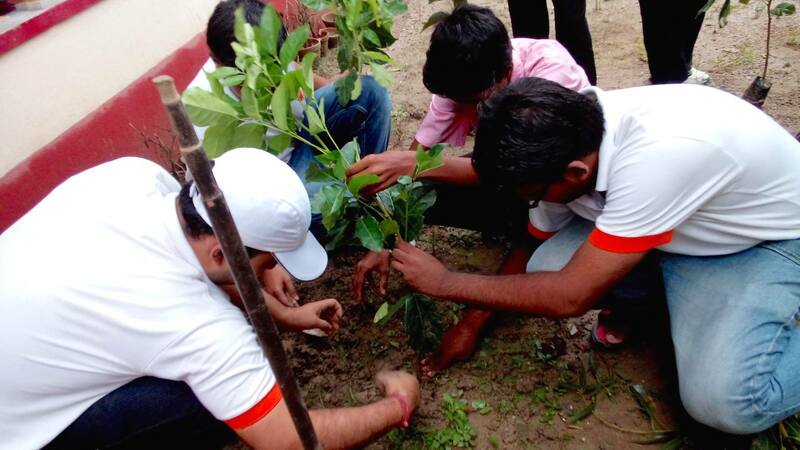 ), and afterwards, we continued with the sapling-planting. By afternoon, the Bodhisukha garden was nicely filled up with rows of young plants – and watching the saplings waving in the gentle breeze filled our hearts with not an inconsiderable amount of joy. Things had passed on without a single hitch – it was almost like the completion of a complex mobile app debugging process without a single error being detected! After the planting phase was over, we handed over close to 400 more saplings to the students of Bodhisukha school – which they would plant over the next few days. The school staff has already promised more space for sowing the plants, and our app developers are already busy chalking out the next phase of the ‘Go Green, Help Clean’ drive (including a search for more suitable places for planting saplings). Our Australian chapter – Teks Mobile Australia – would be starting the campaign Down Under fairly soon too. For each member of the Teks Family, it was a fulfilling experience to be a part of this noble effort – to take up a stand against the rapid degradation of the environment. We are determined to expand the reach of ‘Go Green, Help Clean’ as much as possible (and as quickly as possible)…so wish us luck about that. Oh, and if possible, why don’t you plant a sapling somewhere nearby after you have read this? It will be for a good cause! Let’s sign off this week’s ABT with a bit of happy news on the professional front, what say? 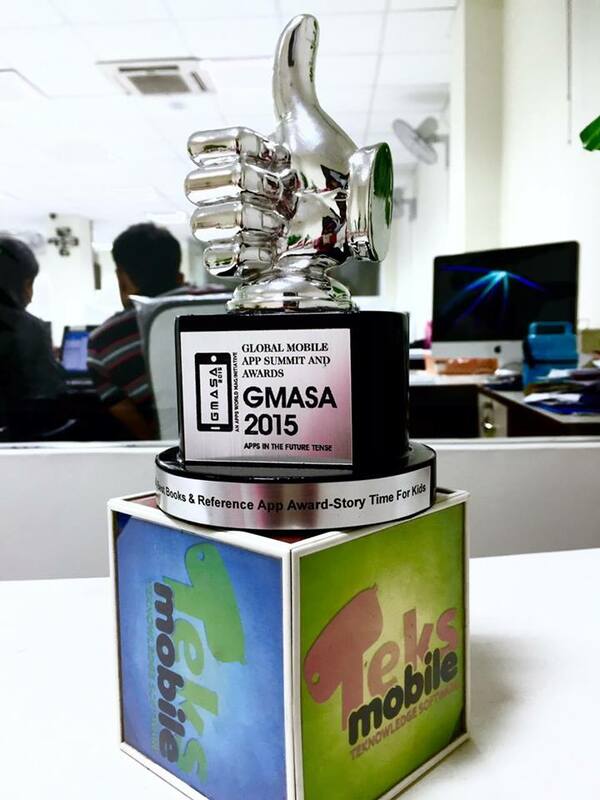 Story Time For Kids – our mobile storytelling/reading app for children – has bagged yet another prize. This time, the recognition came at the Global Mobile App Summit & Award 2015 (hosted at Grand Chola, Chennai), where Story Time was selected as the best app in the ‘Books & Reference’ category. Participating in the summit and listening to the keynote addresses by eminent personalities from the mobile app industry, like Rico Wyder and Chris Jensen, was a great learning experience for us. The panel discussions threw up many interesting points of note as well. Bolly beauty Gul Panag also had a keynote at GMASA 2015, focused on mobile fitness. So, what’s the big takeaway from this edition of AppBoard Tuesday? Easy enough – you can keep striving for corporate success and recognition, and simultaneously, take up the urgent responsibility of enrichening our nature. Team Teks has taken the pledge to try to fight environmental pollution hazards to the best of our abilities, and we are sure that our ‘Go Green, Help Clean’ will make a difference over time. It also gives us a scope to prove that mobile app development is not the only thing we are good at! Okay then, that’s about that in today’s edition of AppBoard Tuesday. ABT will return next week, with an interesting app-related topic. Till then, love thy apps…and remember to go green whenever you can!